Converse All Star Chuck Taylors changed the world of footwear forever. When Chuck Taylor strolled into the Chicago sales office of the Converse Rubber Corp. in 1921, he was about to change the way the world walked. . .
And ran, jumped, pivoted, shot free throws and played defense. Taylor was a two-time Indiana all-state basketball player whose jump shot was good enough to pay the bills for 11 seasons. His problem in the summer of 1921 was sore feet. He wanted Converse to improve the sneaker it had been making since 1917. 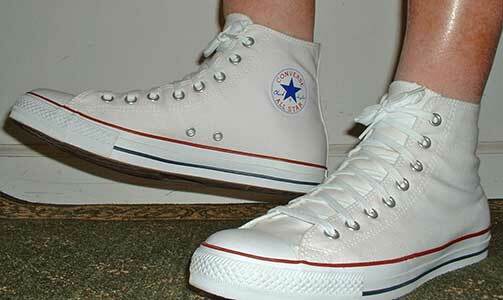 The result was a better Converse All Star, which, twelve years later, carried Taylor’s signature as part of its star-inside-the-circle logo. Forty-one years later, I bought my first pair of chucks when I made the Walnut Junior High School basketball team, my parents having to pony up the outrageous sum of $6. But with a pair of white canvas high-top chucks on your pups, you had arrived at any price. On Saturday, Nike, which unlaced a portion of Converse’s then 80 percent claim to the sneaker market when it introduced performance athletic shoes in the 1970s, will unveil the Air Jordan XVII. They will come in their own shimmering, silvery, metallic briefcase rather than a shoe box. They will have the signature logo of Michael Jordan. They will be the 17th edition of Air Jordans. They will have an accompanying CD. Air Jordans have become the most recognizable star in the Nike universe, a vast leather and synthetic rubber empire, the power of which in the sports world is matched only by network television. Air Jordans have become so valuable that many buyers will never wear them, preferring to show them only like some polymer-based objets d’art. Expensive sneakers carry more cultural weight than a power forward. Nike had to change release dates for new editions of Air Jordans to Saturdays because huge numbers of kids started skipping school and queuing up outside sporting goods stores to get the latest model. Owning such a treasure can be dangerous -- and deadly. An expensive pair of trendy tennies are an inviting target for bullies, thugs and armed robbers. Kids have lost their lives because someone wanted their pair of air this or pump that. Sneaker super salesman Chuck Taylor never encountered violence over a pair of basketball shoes, but then, none of his came in a briefcase, nor did Orson Welles direct any radio ads for Converse. Nike will have to produce a lot of air to have the staying power of chucks. By the time Nike, Adidas, Reebok, New Balance and a horde of others had entered the sneaker wars, Converse had added a palette of colors and designs to its chucks. Soon, such delights as low-top greens, stripes and pattern numbers and hot pink high-tops were available. Today, sneakers are everywhere. The market counts by the billions and not at $6 a pop. Sports stars help design shoes that supposedly make you run faster, jump higher and look very cool doing both. And if you think $200 is too much for a pair of sneakers, don’t blame Jordan or Nike or pop culture. You can blame — or maybe it’s thank — Chuck Taylor. —George Ayoub is senior correspondent at The Independent.